Every week in our careers we face new situations, new opportunities to advance our career and new questions about what we should do. The "What to do when..." weekly blog posts are designed to provide you with some alternatives and suggestions for those tricky situations. 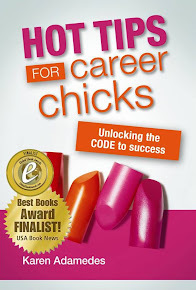 This is the first in the series and we will be chatting about a huge range of career-related topics in 2012. These will include "What to do when... you get negative feedback", "What to do when... you resign", "What to do when... you can't get a word in during a meeting" and many many more! But I digress. Today's topic is what to do when you get the call, email or tap on the shoulder and are asked to do a presentation. Presentations can be scary but they are great opportunities to showcase what you know and how much you are contributing to a business and your role. 2. Ask questions - and clarify exactly what is required. 3. Plan to devote some time to preparing. 80% of a good presentation happens in the planning and preparation stage. And this makes the presentation itself not so scary - when you know the needs of the audience, your key messages, the room, the technology and how and what you are going to present - the actual presentation is the fun bit! So if you get asked to make a presentation - say yes - and then think about the rest. Research, mentors, your network - there are plenty of places to get help. Here's a blog post on 5 Fast Tips to prepare for presentations that might give you some ideas. P.S. If you have any questions that you would like covered in this blog series - please let me know - leave your ideas in the comments or visit our new Facebook page or send me a message on Twitter! "about what? ", "to whom?" and "when?" If you don't know the topic standing up and claiming you do can be a credibility killer. Whether it is a product you don't look after or a product you don't know about don't try and pretend you do because you will be caught out. Knowing the audience helps you determine whether it is appropriate for you to do the presentation. All too often I have seen sales people eaten alive by a technical audience, destroying their credibility and that of the product being pitched. And there's no point in saying "yes" if you can't attend. Some years ago I chaired a conference where a senior departmental head was supposed to attend and give insights on his company's efforts in ecommerce. 10 minutes before he was due to go on we discovered he was on a beach enjoying his annual holiday. Don't leap in with both feet. Say "yes" only once you know what is expected or you are going to run the risk of making yourself - and potentially your employer - look a fool and set your career and business back. Agree knowing the audience and what is required is absolutely essential. Often we work on the assumption that we are going to say no rather than how we can see yes...is there another technical expert we can bring in to help?, can we clear our diary? Which is why I think planning is crucial. If you can't be there you ca't be there...but maybe you can recommend someone who can. Sounds like your department head should have thought of that!